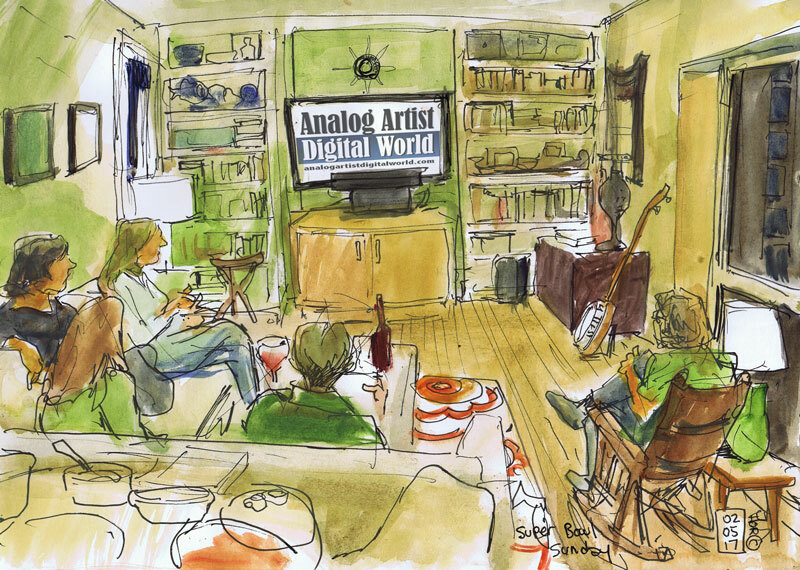 Analog Artist Digital World: Superbowl Party. On Super Bowl Sunday, I went to a gorgeous suburban home right on a lake. The yard was landscaped with bromeliads and other Florida native plants. There was a nice sized koi pond in the from yard. The crowd watching the game consisted of three woman and two guys, myself included. Now I haven't watched football game all year) but I have to watch the super bowl. I pick the teem to root for based on how much I like their uniforms, so, I decided to root for the team in the red jerseys. Everyone else in the room was rooting for the same team. Our team got off to a great start with two touchdowns. The announcer said that no team had ever come back from a two touch down deficit. The lead was extended and we all grew confident that this would be a rout. Number 34 however kept getting personal flags which resulted in the white jersey team getting first downs. Fans were irate. From my vantage point, I could sketch the whole room and I was right next to the potluck food table which had World Peas, Deviled eggs, White cauliflower that tasted it chick in wings, and sober bowl tots which was my contribution. Half time with Gaga was entertaining, although, she kept jumping off screen. The drones above the stadium animated into patterns and logos. Quite impressive. I walked out back to watch the sun set across the lake. The spacious yard was like a nature preserve. I was told an eagle nests in the area. The final quarter of the game, the tide turned. Tom Brady kept advancing hi white Jersey teams yardage and in the final minutes the score was tied. In overtime, he kept that momentum to win the game. Everyone at our Superbowl party was stunned. What just happened? Why can't I ever get behind a winning team? Well the company was spectacular and there was plenty of laughter. We had Tex Mex to eat after the game and those irresistible thin mint girl scout cookies. I left feeling lucky to have been invited. Returning from New York City. New York City Urban Sketching Workshop. Weekend Top 6 Picks for February 25th and 26th. The Timucua Arts white house. The 58th Winter Park Sidewalk Art Festival. Weekend Top 6 Picks for February 18th and 19th. Trash 2 Trends: a Recycled Runway Show. Weekend Top 6 Picks for February 11th and 12th. DRIP Presents The Blind Date Experience. Drip Drop Splash at the Orlando Science Center. Wicked After Dark at the Abbey. WeekendTop 6 Picks for February 4th and 5th.